Pansies are versatile, bright-colored annuals that are mostly used across the United States to provide color in the cooler months of the year. In northern climates, pansies will grow from spring through the summer months and re-surge in the cool fall weather for a second wave of color. Pair pansies in garden beds and containers with just about anything to highlight or contrast colors and textures, provided that the companion plants prefer the same full to part sun in rich, well-draining soil. 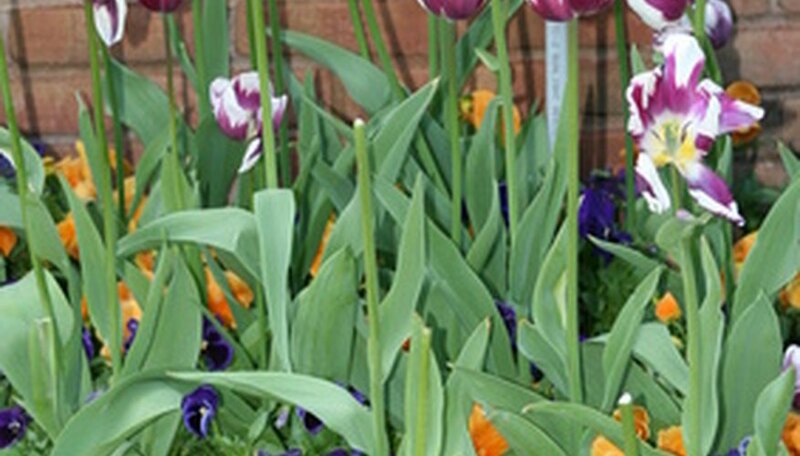 Pair pansies with spring bulbs such as daffodils and tulips to add color and interest at the base of these taller flowers. Since most bulbs are short-lived bloomers, pansies can act to provide consistent color to a bed as your bulbs bloom and fade. Plus, the established pansy plants can hide withering bulb leaves that should be left to fade on their own. Pansies can weather through spring frosts pretty well and are usually available early in the season. Consult a color wheel or take colors from your outside decor to chose the color of pansies best suited to compliment your bulb plants. Pansies may begin to fade in garden beds during the summer months but should perform well in cared-for containers and window boxes. With their distinctive face-shaped blooms, pansies give containers a varied, finished look mixed in with other annuals of different shaped blooms. Use tall spiked plants such as snapdragons and filling plants such as petunias along with a cascading plant such as lobelia or allysum for a container that will show well through the whole season. Fertilize regularly and keep well-watered. Pansies planted in garden beds may begin to fade a bit in the warmest weather, so plant around them accordingly. Place at the base of perennials such as bee balm, dianthus and coneflowers to add texture to the perennial bed as those plants grow. As the summer begins to wane, pansies will gain a resurgence in your bed and will give a new show of flowers until winter. A self-sower, pansies will often reappear year-after-year where planted. Offering pansies again for sale in the fall has been a growing trend in northern zones and a wide-spread practice in warmer climates. A hardy plant that will continue to bloom through frosts until a hard cold spell, pansies can be added to beds or containers for a fresh look when other annuals are spent. Pair with mums, sunflowers and black-eyed susans for a colorful autumn garden. Plus, pansies planted in fall will often grow back in spring, giving you more bang for your buck. Icicle pansy varieties are specifically bred for cold-weather enjoyment and are available in most full-center garden centers and some department store garden centers.